I don't know how many of you have seen the new SURFER Magazine that's out, but on the cover is a beautiful shot of Reef McIntosh standing up in a HUGE Backside Barrel at Cloudbreak in Tavarua. The shot is from the very same session that Crop and Phil were witness to. It truly is an awe inspiring photograph. It's also very deceptive. Because as nice and as perfect as the photo seems to indicate, it's nothing of the sort. It is in fact, very dangerous. I know, I edited the footage from those sessions. It's amazing how a still photograph can paint all kinds of false impressions. That wave is indeed perfect, but it can also kill you. Like in dead. Anyway, that same issue has a list of 67 things you need to do before you catch your last wave. To my surprise, I was able to acknowledge 62 out of the 67. There were five things on that list that I have not done. Which ones are they? Well, I've never commanded my own boat into a surf break. (58) I have been the first mate to several outer reef and outer Island trips with Captain Hazzard (Lenny Nichols) on Oahu over the years. But I've never put it all together as the Captain of my own ship. And another is, I've never entered a Surf Contest. (2) How can this be you ask yourselves? How can I, who announces the where and when Surf Contests take place, lay claim to having never entered one? Well, it's true. I do support the local ESA and the contest scene (it's great for the kids and for getting good surfing on video) but, it was never for me. I guess, I'll always have the perfect contest record. Or maybe, I'll wait until I'm 75 and then I'll enter one. That would be funny. Especially if I beat Kevin Grondin. Oh the inhumanity of it all. Sorry Kevin. I just think it would be hilarious if the first contest I ever entered, was against you, and I actually won. But that won't happen for two reasons. First, I'm keeping my record perfect. I won't enter at any age. And second, Kevin can surf circles around me. He always has, and the last time I checked, he shows no signs of slowing down. The others are number (48) Stump your doctor. This is one where your supposed to contract some wacked out disease while surfing some exotic break and then stump your doctor. Never happened to me. Then there's (61) Watch the Pipemasters from the beach. Never had that opportunity. Finally, (19) Get Interviewed by Curious Gabe. Well, that never happened. Somehow I can't say that my life is shallow because of never having Curious Gabe interview me. How big of a deal is it? I mean doing 62 of the 67 things on that list. Not much. I was just surprised to read that I have already accomplished most on that list, or in some cases, suffered some. 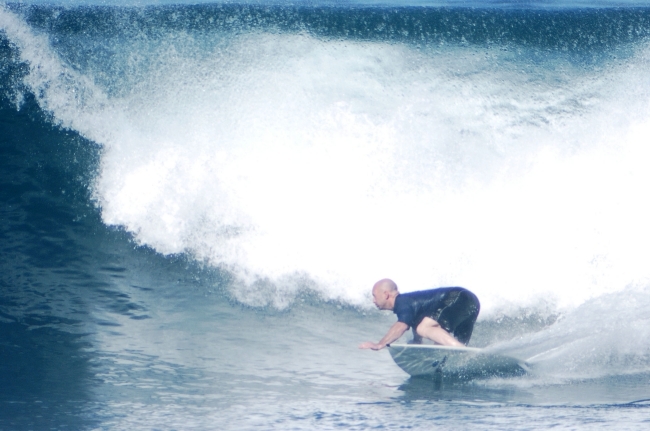 I guess I need to see about filling the last 5 on that list to qualify as the "Been there done that" Surfer. Or maybe I don't. I'm secure and content of where I'm at in my surfing life. We should all be. 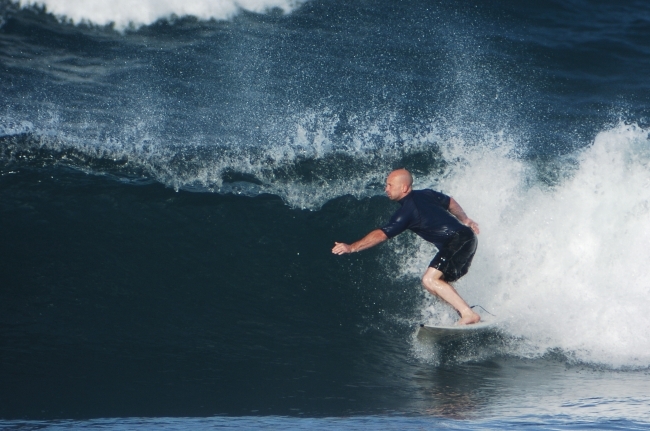 I'm not saying you shouldn't spread your wings and experience all that surfing has to offer. I just don't think you need to follow what some magazine guys came up with as a "Must do" before you die concept. In fact, I'll add number 68 to the 67 things to do. 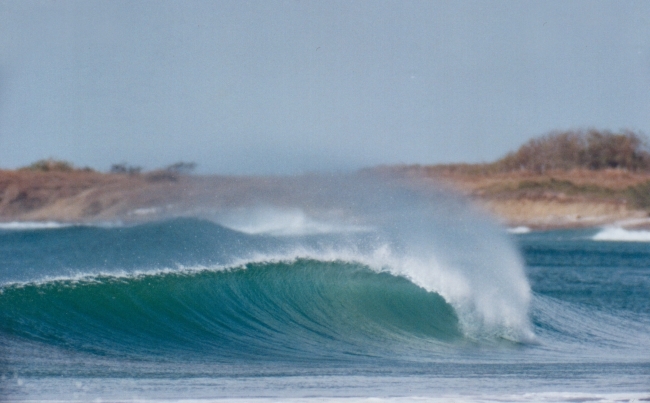 Try surfing in New England for one whole year. That swell last Sunday was such a tease. I mean, we surfed. We actually surfed. It felt good. Now it feels bad. The water temp today was so nice. It was "trunking it all the way" nice. And it was glassy too. But there was no surf. Well, there was small surf for those of you who are just starting out. But the rest of us? We're starving. We need surf. Someone said something about surf on Thursday. Ha! I'll believe it when I see it. I feel bad for the older guys and girls. And, I feel bad for the younger ones too. But this is our world friends. Summer in New England. Last Summer was so much better. It was consistent and warm. This summer is the opposite. If you want waves you gotta travel for them. Like the Reynolds, The Linsemans and the Grondins. They all scored great surf this summer. They are NOT suffering like the rest of us. They have gotten their bellies full of good waves. Unlike you and me. They are satisfied. They are sickly plump with the memories of warm double overhead tropical barrels. While you and I are getting 3 hour chest high swells once every 2 weeks. And to add insult to injury. The dam Greenheads are out. Now I don't know about you guys, but them dam bugs to me, are the worst of what our summers produce. Tourists clogging the beaches and the Greenheads eating our asses alive while we grovel over 1' slop...is not my idea of summer fun. Far from it. Why I bet I got bit 8 times today alone. One of them Greenheads actually bit my neck while I was surfing on a wave. Are you kidding me? He bit me while I was riding? Why do them Greenheads have to be so dam hurtful? I call 'em "Satan's Little Helpers". I mean how else can you describe an insect that is so "hell bent" on biting you that it would take a full on human slap, get knocked silly to the ground, then get back up and attack you again? Gotta be the work of the devil. God wouldn't make them dam things. Nope, it's the work of Satan. Speaking of vicious attacks, are the Israelis the Greenheads of the Middleast or what? I mean, they are like Yellowjackets. If you step on 'em they are coming after you. No if's ands or buts about it. They are coming. And they are bringing their sharp teeth. Last week I was concerned about Kim Jong il in North Korea (I still am), this week the whole Middleast is blowing up. Look I know the whole Palestine/Israel land dispute has been ongoing, but the Hezzbollah and Hamas are two Terrorist organizations that are supported by both Syria and Iran. That spells trouble for all of us. Yes us, meaning 'us Surfers'. There's surf in the Mideast. There really is. There are Surfers living with the threat of an errant missile landing in the middle of their hometown beachbreak. It's true. Look it up. People surf in the Mideast. Look, we all want world peace and the freedom to be able to surf wherever we want in this world. Right now, that's not possible. The world needs to change. I don't have any answers or suggestions. However, I do have hope. Pray for Surf. Pray for Peace. 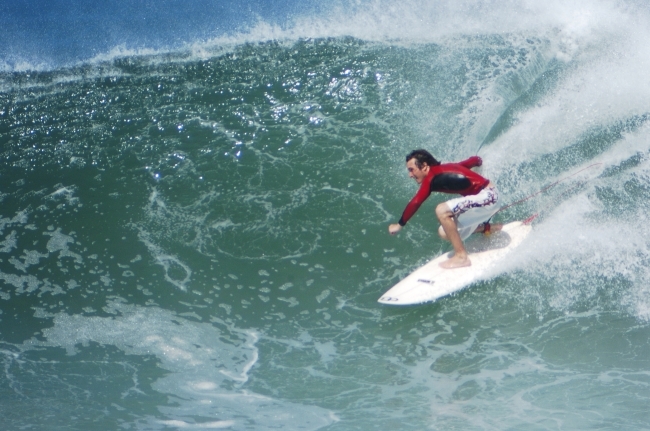 Last week I told you about Johnny Reynolds and his son Perry and their Costa Rican trip . Now it's Ken Linseman and his son Kyle's turn. 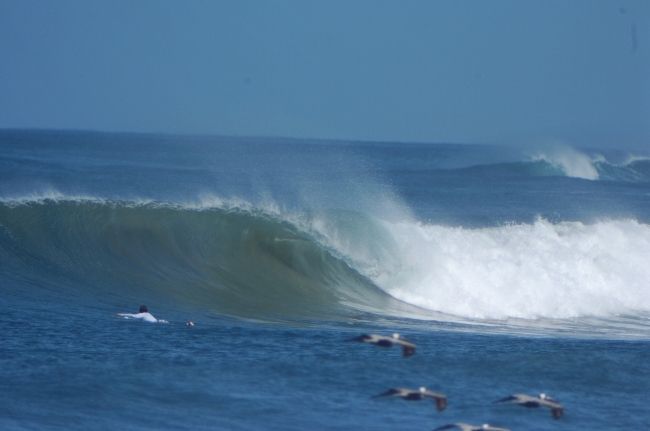 Enjoy the photos...because this is as close as you'll get to waves like this unless you travel for them. It's out there if you want it...ya just gotta pay for it. Somebody better pinch this kid. He may think he's dreaming here. 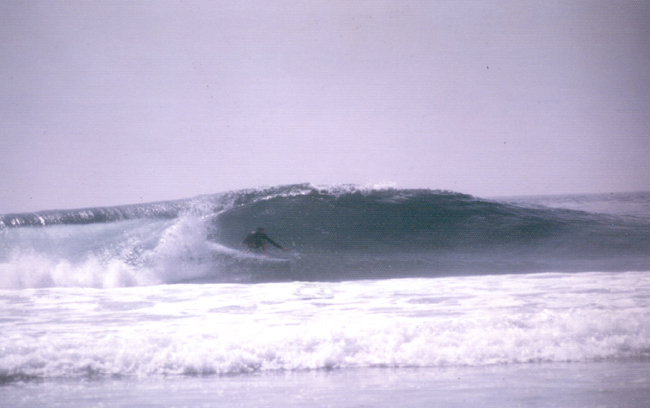 Perry Reynolds on another BIG Wave. This just in from the Phantom. The boys in Cali have developed a new Summer Grilling Technique that's taken the West Coast by storm. 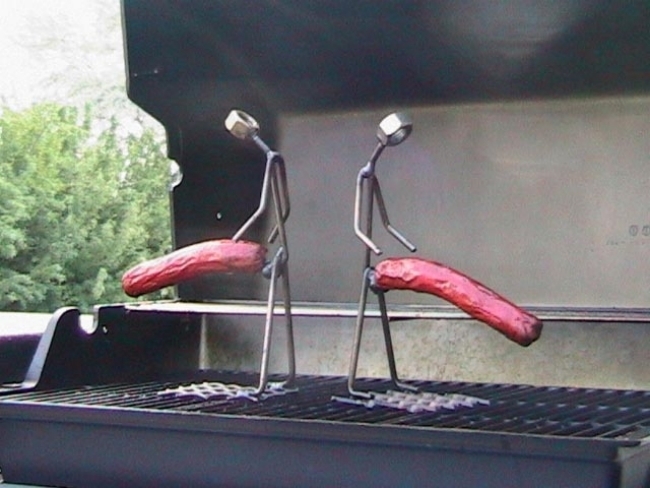 Call it Broke Back Hot Dog Grill...Go figure!